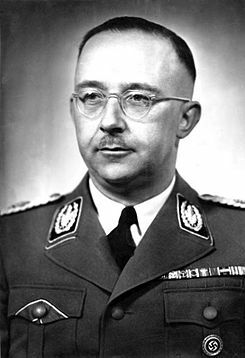 Brighton and Hove News » Did Brighton and Hove soldiers help capture Himmler? Did Brighton and Hove soldiers help capture Himmler? A historian believes Brighton and Hove soldiers may have helped capture Heinrich Himmler as World War Two drew to a close. Chris Mannion is writing a book about the Nazi commander’s final days, when he was arrested by the Allies, later killing himself by biting into a cyanide capsule. He believes Captain P.J.H. Pither of Hallburton Rd, Hove, L/Bdr F. Brigden of Ingham Crescent, Hove. and Lt C.E.H. Drew of Beaconsfield villas, Brighton may have taken part in Himmler’s capture. The commander was captured on May 21, 1945, as he fled the republic in disgrace for attempting to broker a peace settlement behind Hitler’s back. Mr Mannion’s grandfather L/Sgt Patrick Mannion of Newton le Willows was one of five men in the patrol which arrested him. He has identified two of the others, and believes P Pither and C Drew may be the remaining pair, as they were members of the 196 Battery, 73rd Anti tank, Royal Artillery from which the patrol was made up. He is appealing for any relatives who may have service records, photographs, family stories or other information to come forward and help him solve the puzzle. Mr Mannion said: “I know these men P Pither and C Drew were members of the 196 battery, which landed on D-Day and fought through France, Belgium, Holland and Germany. They used these addresses when they signed up.